What is the Trails for Tomorrow fund? 1) The Trails for Tomorrow fund can be named in a will as a beneficiary. 2) Donations to the fund can be made at any time. To stay running each year, the 150km KCTS trail network requires over $100,000 worth of paid work, countless volunteer hours, and the generosity of 30 local landowners. 95% of annual funding is approved on a year by year basis by local government. Besides improving the quality of life that residents enjoy, the trails are a significant tourism draw and a big reason for the influx of young families, professionals and home based technology workers to the area. To help ensure that future generations inherit a trail network that is even better than it is today, the KCTS Board of Directors has established an endowment fund through the LeRoi Foundation. The fund will generate annual income in perpetuity that the KCTS will invest back into the trails each year. As people make donations or bequeath funds in their wills, it will diversify and provide a backup for our funding. 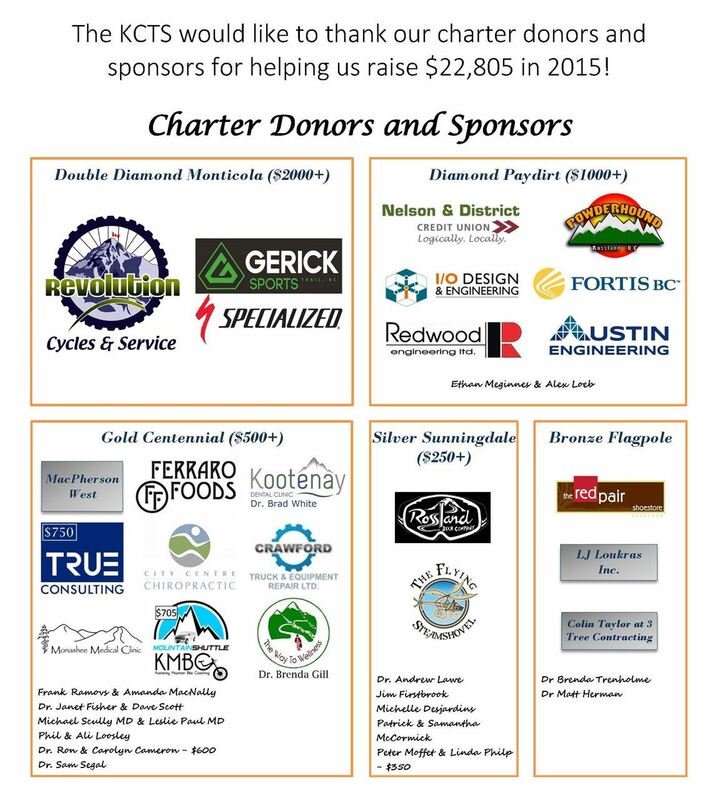 The KCTS would like to thank all of our donors. Cheques – please make out to the "LeRoi Community Foundation"
In the memo please write "KCTS Trails For Tomorrow Fund"
Email information@KCTS.ca if you would like to be added to the public donor list. Businesses please send us your logos! Legacy Donors – Show future generations that you care! Stocks or Life Insurance – Can be exempt for Capital Gains Tax!